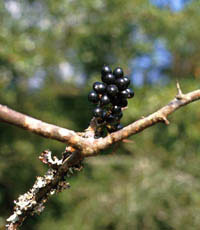 As opposed to the two other native bumelia species, buckthorn bumelia is usually thornless, and has narrow, pointed leaves instead of rounded ones. It grows from 25' to 40' tall, and is usually found on swamp edges or riverbanks. It is extremely uncommon in Texas.